The Drawing Room has relocated to the former Vasco space after a two-year hiatus. The new location, at the top of PMQ in Sheung Wan, is headed by former Vasco chef de cuisine, Gabriele Milani. The elongated dining space is narrow but well-lit throughout. Divided into sections, tables are very well-spaced offering much privacy for guests. Larger parties of four to six should choose to sit at one of the spacious booths, or in the private dining room separated from the main dining area. The terrace is spacious with a view looking over the quarters of the PMQ and the Mid-Levels, but more importantly it is better for cooler months of the year. The menu at The Drawing Room is a short two-pager, consisting of a seasonal menu featuring dishes created by chef de cuisine Gabriele Milani, and a classic tasting menu with dishes that were signatures from the previous restaurant but renewed with a slight twist. Guests can choose from the menu to form their own set dinners but we found that a standard four-course at HK$798 or five-course at HK$998 a much better value option. The grilled quail with foie gras mousse is an interesting mix of textures; the quail, grilled to medium rare, is pink and meaty. The cherry marmalade on the side is tart enough to cut through the richness from both the bird and the foie gras mousse. Langostine tartare came highly recommended. The large quenelle of chopped langoustine is refreshing with the cucumber mayonnaise, although the Amalfi lemon cream was missing from the dish. Creamy baccala with sweet garlic broth and taggiasca olives is a light, refreshing mashed meat of salt cod paired well with briny taggiasca olives. 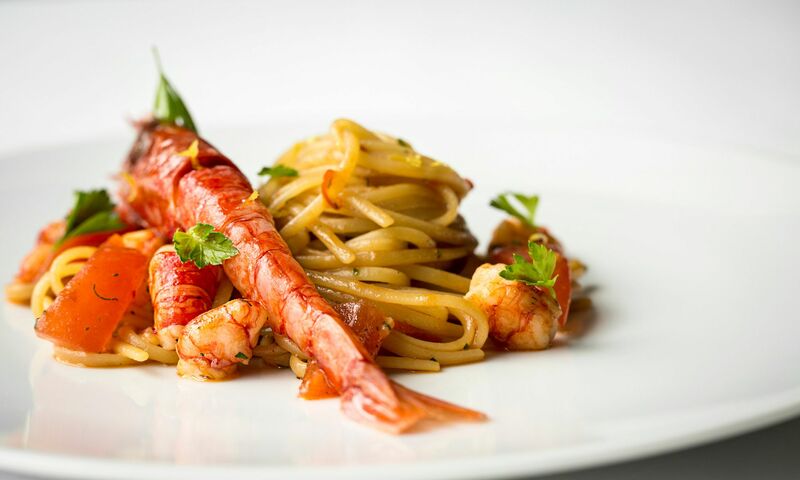 The Italian red prawn linguine is impeccable, the coral and tomato sauce clings onto each strand of linguine, and a medium-rare red prawns bringing extra umami to the dish. The mains are slightly weaker compared to previous courses. Chargrilled pigeon is beautifully medium rare and pink, great with mustard jus but the accompanying spinach was over seasoned and too oily. Roasted black Angus tenderloin brings a good contrast with braised ox tongue, although serving the meat with the same mustard jus lacks surprise for the guests. Desserts tend to be on the simple side. The brioche is a creamier version of a pain perdu. The buttery cube of bread, melting in the mouth with vanilla ice cream and buttery crumbs, is simple as it comes but satisfying as a simple dessert. The fragole, or strawberries with orange, basil and mascarpone ice cream, is a simple fruit salad. Cut strawberries with orange and basil are refreshing and mascarpone ice cream is creamy and with just right level of sweetness. The wine list predominantly covers France, Spain, and Italy, starting with one page of bottles on promotion. The by the glass menu is a rich range of reds and whites. The Tenimenti Luigi D’Alesandro Borgo Bianco 2014 is refreshing and light. Its fresh acidity and minerality is a versatile match from seafood starter such as langoustine tartare to the strawberry dessert. Dessimis Pinot Grigio, Vie di Romans Fruili 2013 takes an off-pink hue, its aromas of berries and flower bouquet are inviting, followed by richness on the palate, making the wine a good match with richer dishes such as grilled quail with foie gras mousse as well as grilled tenderloin for mains. The service at Drawing Room is attentive and friendly, where staff are well-trained with information on the dishes’ execution and wine knowledge. Guests seated in the dining rooms adjacent to the main dining area may have a little difficulty getting attention from the staff, but once prompted the service is smooth and helpful. A dinner for two including one glass of wine each amounts to just over HK$2,000. We can see chef Milani’s potential and the path to restoring The Drawing Room’s legacy is making promising progress.